Totally inspiring, utterly absorbing, ridiculously versatile and sounding phenomenal, VPS Avenger is quite unlike any other synth out there. Stupendously powerful and architecturally innovative 2000+ waves, wavetables and samples. Epic modulation. Mod Matrix is too small. Vengeance-Sound's first ever virtual synth is nothing if not ambitious. Avenger's vector-based and resizable GUI is unfussy in its layout. On the left are the file browser and Effects section; in the middle are the Oscillator section and a tabbed page containing various editors, sequencers and modulation controls; and on the right are the Filter, Amp and Shaper sections, and the Modulation Matrix. At the very bottom of the interface sit the usual virtual keyboard/ wavetable view, and five freely assignable Macro knobs and buttons. As with any synth, the action starts in Avenger's Oscillator section, where up to eight - yes, eight - source signal generators are loaded. As well as those, Avenger also features a full-on drum machine section. FM and AM knobs enable instant transformation of the sound. The preset drum library contains over 160 full kits, each with an accompanying sequence, although kits and patterns are mix-and-matchable, too, and you can drag your own samples in. The kit can be played by the Drum Sequencer when a MIDI note is received, or unhooked from the Sequencer for triggering via a keyboard or pads. The Drum Sequencer is simple but effective. Click notes in with the pencil tool, select them with the marquee tool and adjust the Velocity, Pan, Pitch and Gate time of the selected notes using the so-named knobs. Velocity can also be edited by dragging the stalks under each note, and rolls of up to eight hits can be specified for individual notes. Clicking a waveform reveals that sample and its editing controls in the main Editor. Adjustable parameters include Volume, Pitch, Pan and Spike, the last for boosting transients (and also included in Avenger's main Amp module). Additionally, the triggering can be offset in either direction, for effortless 'smearing' of claps and snares - a welcome feature that's all too rare in drum machines. Each drum also has its own Route panel, for routing through the Shaper, Step Sequencer, Effects and Master Filter sections, but not the 'insert' Filter or Amp. Avenger's Drum module is great fun and a worthy inclusion. It's just a shame each channel can only load samples, not synth oscillators - although we're told this is planned for an update. Rather than simply merging the oscillators into a composite tone in the mixer, as other synths do, Avenger treats each one as a wholly discrete sound source, to be triggered and mixed with others in the traditional way if desired, or sent off down its own path as the basis of a self-contained and separately sequenced 'instrument'. One oscillator could supply a bassline, while the next two blast out a lead, the next three a pad. The Oscillator Route panel sets the course of the currently selected oscillator's output signal, passing it through your choice of the potentially many active filters, amps, pitch envelopes, arpeggiators, trancegates, effects racks, etc all the way to final output block. Thus, one oscillator could supply a bassline, while the next two blast out a lead, the next three a pad and so on, each 'instrument' triggered by its own arpeggiator, processed through its own effects, and modulated by its own step sequencer, envelopes and LFOs - and all at the press of a single note on your keyboard! Indeed, with that in mind, the oscillators can even be renamed. When it comes to modulation, Avenger is possibly the most well-equipped synth we've ever met. The numbers are mindboggling: eight Pitch Envelopes, eight multi-breakpoint Mod Envelopes, eight Step Sequencers, four Amp Envelopes, four Filter Envelopes, four LFOs, three Macro knobs, an array of 'Maths' functions, all the standard MIDI messages and several CCs, and the oscillator Wavetable Envelopes and Vibrato LFOs. Needless to say, the list of targets is even more extensive, covering - we think - every parameter of the instrument, from the oscillators and filters to the arpeggiators and effects. Up to 256 modulation assignments are made by dragging sources onto targets or selecting both in the Mod Matrix, while amounts are set by dragging the tiny triangles that appear next to modulated parameters or the sliders in the Mod Matrix. Assignments are grouped by mod source in the Matrix and collapsible to reduce clutter, so you can switch any source out to change all of its assignments at once. The modulators themselves are all well up to scratch. The LFOs feature 17 preset waveshapes and three user-drawn ones; the Mod Envelopes can be synced to cycle over up to 160 bars and include a Loop+Release mode, in which the signal loops to Release marker while the note is held, then jumps to the Release point, continuing until released; and the breakpoint Pitch Envelopes are polyphonic, to give just a few highlights. You can insert Gain blocks wherever you like in the signal path for volume adjustment, the Shaper (a superb waveshaping distortion module) is freely positionable, and multiple filter blocks in a Route can be arranged in any order. Other than that, the path is fixed - you can't place the Pitch Envelope after the effects, say. Each module can be bypassed, though, or removed entirely (ie, returned to the module selection menu at the top of the panel). Setting up the signal flow like this feels quite unusual, but it means each oscillator (or a group of them) can effectively serve as a self-contained 'synth within a synth'. The flow of each oscillator is represented throughout the interface by colour-coded bars at the top of each module - green for Osc 1, pink for Osc 2, etc. With so many of each module type possibly visible at once, this is extremely helpful. You can also right-click any block in the Route list to locate its module in the interface via a nifty animation. Clicking the menu above the oscillator waveform display brings up an enormous categorised list of sonic starting points. You get the analogue staples, naturally - Saw, Square, Triangle, Sine and noise waves - but beyond those lies a veritable sweet shop of single-cycle waveshapes, samples (up to four of which can be stacked in a single oscillator) and wavetables. There are somewhere in the region of 500 waves, 500 wavetables and well over 1000 samples, providing an almost overwhelming 5GB library of oscillator fuel in every conceivable category. While the expected dance and electronic-orientated sounds dominate (this is Vengeance, after all, and that's very much its bag), there are also loads of acoustic and electric instrument samples in there. 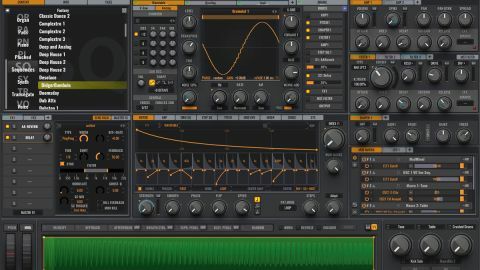 Oh, and you can draw your own waveshapes freehand using the mouse, too, and load your own samples in as wavetables, so there's really no limit to what Avenger can use as source material in each and every one of its oscillators. On the left-hand side of the Oscillator section, alongside adjustable volume, panning, tuning and noise, FM and AM knobs enable instant transformation of the sound, each drawing on a range of nine fixed waveforms and three editable ones, while the Vibrato section dials in cyclical per-voice pitch modulation. The confusingly-named V-Saw tab houses Avenger's unison controls, with which a stack of up to seven detuned, spread voices is invoked. The Voicing tab reveals a four-voice chord generator and volume, wave selection and pitching parameters for the dedicated sub oscillator. With a wave or wavetable loaded, the four knobs to the right of the central oscillator wave display present a variety of shaping options, including 'bending' to the left, right or centre, sync, formant filtering, bitcrushing and sample rate reduction. With one or more samples loaded, these knobs mirror four of the controls in the main Sample Editor immediately below, for adjusting those parameters for all samples in the stack together. The wave display itself, meanwhile, shows the synthesised waveforms in real-time, so you can always see what effect your wranglings are having on them. It not only looks very cool, but is also hugely informative. The Editor tab of the bottom-centre pane is also contextual. With a sample loaded, it becomes a basic sample playback editor, offering repitching, keytracking depth, start point offset and randomisation, onset delay and bitcrushing/sample rate reduction. With a synthesised waveform in place, it switches to the amazing FFT spectrum filter, where the harmonic make-up of the signal is adjusted, either freely or in terms of harmonic and disharmonic components. With a wavetable loaded, things get a bit more complicated. The Editor defaults to the multi- breakpoint Wavetable Envelope, which modulates the Index knob, controlling the progression of the playhead through the wavetable. At the same time, the wavetable itself pops up in place of the virtual keyboard, with an overlaid volume envelope. The Wavetable Envelope is manipulated in various ways with the controls below, and features an optional step sequencer for programming time-multiplied envelope repeats. The other tabbed pages of the central pane host a variety of other interfaces, including a DAW-style mixer (again highlighting Avenger's 'workstation' approach), a key and velocity zoning page, the Pitch and Modulation envelopes, the Arpeggiator and the Step Sequencer. The Arpeggiator (of which up to eight can be instantiated, each switching between up to four patterns) is much as we've come to expect in any modern synth, with pitch offset, full rhythmic control, buttons for nudging the pattern up/down and left/right, and a big library of preset patterns. The Step Sequencer (also eight in number) does the 'trancegate' thing by default but is available for assignment to pretty much any target in the Mod Matrix. Finally, Avenger has a ton of effects onboard, mostly taken from Vengeance's various VPS bundles, but with six all-new Vintage emulations, too, courtesy of Arts Acoustic. There are 32 modules in all, including delay, reverb of all kinds, dynamics, EQ, distortion and more, and you can load eight of them at once into each of four insert racks, two Send Racks and a Master insert rack. That, in case you didn't take it in, is a lot of effects. We'd need the whole reviews section to cover everything Avenger can do - there are so many things we've not had space to get into, such as the extraordinary range of filter types, the tagged browser and the ease with which you can make your own wavetables, to name but three. Every one of its individual elements is a powerful system in its own right, and they all come together to constitute a synthesiser of dizzying power and flexibility. Its pseudo- multitimbral, semimodular architecture is ingeniously implemented, with only the lack of multiple outputs into the host DAW and the cramped Mod Matrix letting the side down. Most importantly, though, it sounds absolutely incredible, with that characteristic Vengeance energy, power and richness married to the deep textural nuance that only wavetable synthesis can bring. Make some room in the heavens, Omnisphere 2, Serum, Massive and Spire, because the pantheon of bona fide supersynths just grew by one.